Come experience the beautiful mountain trails of Mint Springs Valley Park with the 6th annual Crozet Running Trail 5K on Saturday May 11th at 8:00am! Enjoy a great morning at the park as this challenging course winds up and down the mountain trails and finishes at the pavilion at the upper lake. Registration is just $10.00 for adults, $5.00 for kids 12 and under and includes the coveted race t-shirt! This is a community event, meant to bring runners, kids and families, and walkers all together on the trails. 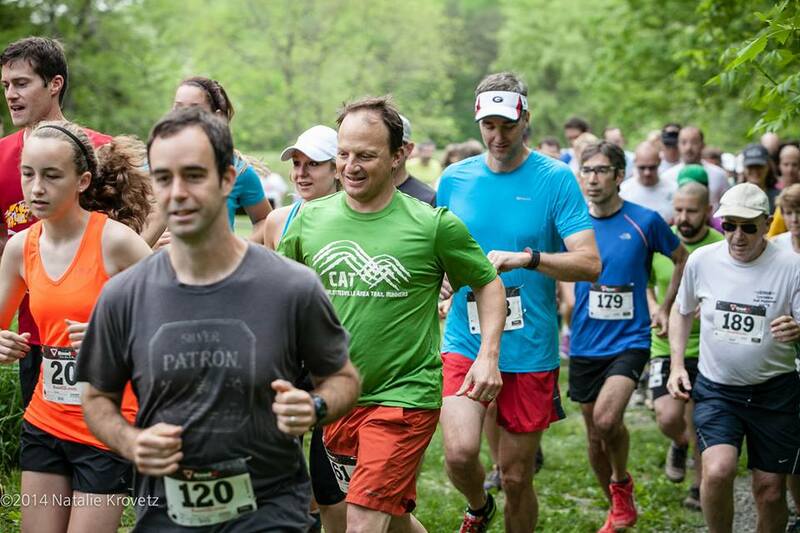 Also, this will again be the first race of the 2019 Charlottesville Summer Trail Running Series, a 4-race series of 5k to 5-mile distance trail runs that finishes in August. See the Charlottesville Area Trail Runners page for more details, but you can also register for the series when you register for the CR Trail 5k, or you can also register for the series in person on race day. This race sells out every year, so register now!! Prizes will be awarded to the top three overall male and female finishers, and top 3 in the mens and womens age groups for 12 and under, 13-17, 18-29, 30-39, 40-49, 50-59, 60-69, and 70+. Kids and families are encouraged to enter! Walkers and hikers welcome! This will be a timed event and all runners will be given bibs with a race number at packet pickup. Bibs and T-shirts can be picked up at Crozet Running on Friday May 10th from 10am-6pm and race morning at Mint Springs from 6:30-7:30am. 275 runner limit! There will be race day registration for any remaining slots. 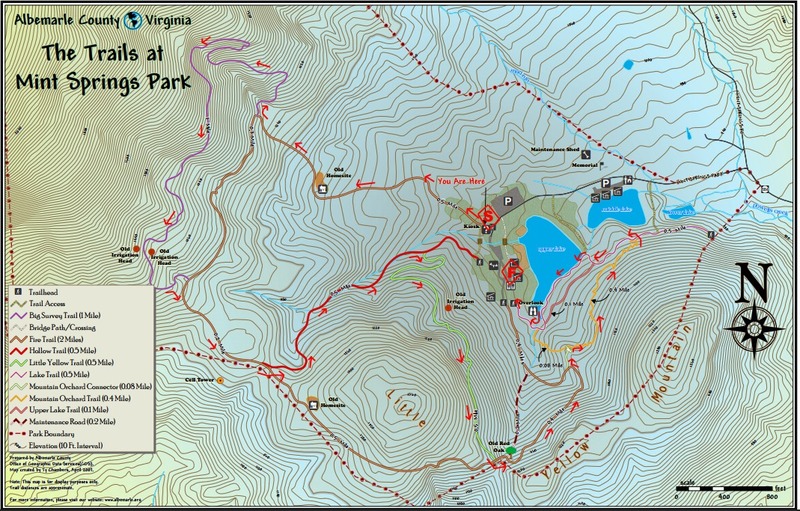 The Crozet Running Trail 5K is a 3.4 mile course starting at the field above the upper lake, winding up and down the single track trails of Bucks Elbow Mountain and Little Yellow Mountain, before rounding down around the upper lake and finishing at the pavilion near the beach. This is a challenging course with a lot of steep climbs and rugged terrain, however it is a beautiful course serving up some of the best trails and views in Crozet. -There is a lot of elevation gain. You will likely be hiking some of the steep uphills and running the flats and downhills. 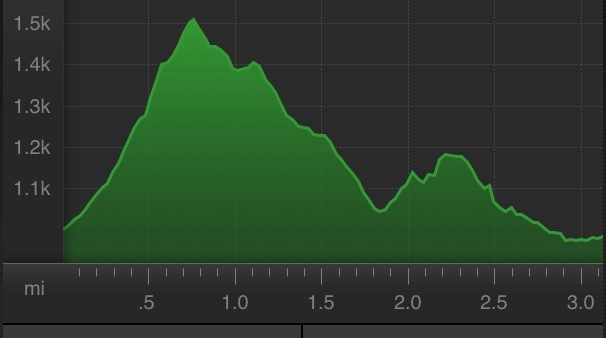 You will be cursing the race director once you reach the powerlines. -Beautiful trails, mostly single track, some double track. No roads. -Bibs, timing, and a fun, friendly, and festive atmosphere! The Crozet Running Trail 5k is a unique race in that it is a true, mountain trail 5K. You will get see all of what trail running is about, in a great 5K distance course. 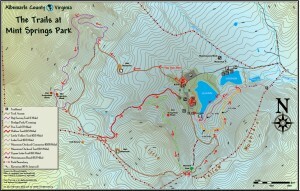 Start-0.5 miles: The course starts in the large field above the upper lake and quickly enters the woods on the ‘Fire Trail’, an old fire road trail that slowly, but steadily takes you up the mountain, getting steeper as it progresses. You will likely get your feet wet at a small stream crossing at the beginning of this trail. 1.4-1.6 miles: After turning right onto the Fire Trail, you’ll be treated to a short section of wide downhill to get your heart rate back down. 1.6-1.9 miles: You’ll turn left onto the Hollow Trail which takes you back down almost to the playground. This is a rocky, rooty descent, but a lot of fun and filled with mountain laurel. 1.9-2.4: Turn right onto the ‘Little Yellow Trail’, which takes you up Little Yellow Mountain on a beautiful winding trail, but with a few steep sections of climb. This trail spits you out at the “Old Red Oak”, an impressive ancient red oak tree. 2.4-2.7: Now you’re back on the Fire Trail and will descend down a wide but rocky trail through a mature forest of poplar trees. 2.7-2.8: Turn right on the Mountain Orchard Connector trail, then take another right onto the Mountain Orchard Trail. 3.2-3.4: The Lake Trail takes you along the shores of the upper lake and finally spits you out at the finish line by the pavilion/shelter. The race is held at Mint Springs Valley Park in Crozet, Virginia. From the 4-way stop in downtown Crozet, head west onto Railroad Ave for 2 miles, and Mint Springs is on your left.